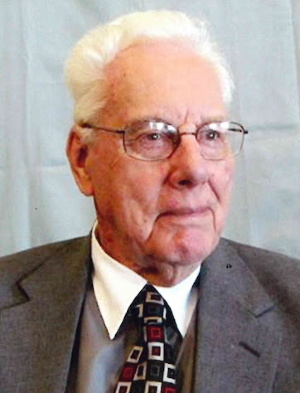 John Henry Groff of Lancaster, PA, passed away January 19, 2019 at Arbor View, Willow Valley Communities Lancaster PA.
Born January 19, 1924 in Lampeter to the late John Herr Groff and Francis Mylin Groff. He was married to the late Shirley Barr Groff with whom he had three children. She died in 1961. He was also married to Patricia Middleton Groff, who died in 2009. John was a graduate of Lampeter School, Lampeter. After graduation he joined the US Navy which he proudly served his country during WWII. After the war he pursued a career as a Contractor / Builder / Developer. He and his wife Patricia owned property in Bethany Beach Del. where they loved to vacation. They especially enjoyed time at the beach with friends and family. John was a member of the Willow Street Lions Club, REIL of Lancaster, and Friendship Force International. He was a member of First Presbyterian Church Lancaster, and Harvest Presbyterian Church of Lancaster. John is survived by two daughters; Sandra Merz, St. Augustine Fl. and Susan Thomas Manassas, Va. a son; J. Michael Groff, husband of Sandra Willow Street, Pa., five grandchildren; Elizabeth Lugnier (Thomas) France, Emily Pangle (Kevin) Felton, PA, Richard Merz (Lexie) Mountain View, Ca, Scott Groff (Lauren) Willow Street, Pa, Jessica (Sean) Eagle, Co, three great grandsons; Raphael and Alexandre Lugnier, France and Oliver Merz, Mountain View, Ca. He is also survived by his sister Evelyn Keir, Athens, Pa. He was preceded by his brother Benjamin Groff and sister Shirley Ann Lefever. The family would like to extend their appreciation to Dr. Richard Frey D.O. and staff at Arbor View for their excellent care and support. Contributions can be made in John’s memory to www.woundedwarrier/project.org or Harvest Presbyterian Church 517 Beaver Valley Pike Lancaster, Pa. 17602. There will be a Celebration of Life Gathering at a later date at the convenience of the family. My most sincere condolences to the family. I worked for John as a carpenter in the mid 70’s. He was one of the finest and highest quality carpenters I’ve ever worked for, and he brought my skills to a new level. I consider myself to be a better carpenter and person thanks to my experience with him.